I don’t know how to describe my state of being for the last few years. It’s fluctuated, but I guess that’s to be expected. Extreme ups, extreme downs. Part of our human condition. There’s this feeling I’ve had and it’s one I don’t like. Maybe we all get it. A feeling of unrest, a feeling as if I’m looking for something and have no idea what it is. But I’m not looking for anything. It’s not a lack of direction but a stagnancy. Feeling like I’m living just satisfactorily. It seems like that feeling comes so quickly. Why am I doing what I’m doing? I’m content with what I have, I am blessed beyond measure, and life is really good, but something is missing. Perhaps it’s the lack of a goal, maybe I should set my eyes on something. I’ll make 1,000,000 dollars. No, that’s not me. I don’t need a lot of money to be happy. I have goals. Lots. I have all kinds of dreams. I have books I’m writing, websites I’m building, businesses that are growing, and hobbies I’m learning. I sometimes try to make up goals for myself, but they don’t capture my heart. They don’t give me drive and my motivation to complete them dissipates quickly. I’ve been toying with the idea of hiking the PCT since December. I even tried to get sponsored to do it. The truth is, it sounds awesome! What a cool badge to add to the resume. But doing something because it would be cool, is hardly enough motivation. At least for me. There has to be a point of capture. A validation. I have to know that I really want to do it. I started building web pages so I could travel. I can go almost anywhere and work. The other day I was listening to my newest audio book, “The Chronicles of Prydain” by Lloyd Alexander, and it hit me. I want to go on another drive. I want to take my time and have no time schedule. No place I have to be, no time I have to be there. I will work when I need to and will camp in Walmart parking lots. I will take my dog. But where will I go? How far can I drive? I scroll up to Alaska on Google maps. A dot with Barrow beside it lies on the most northern part. That’s as far north as you can go. I click to get directions. There are no roads leading to Barrow. A little more research and I find that the only way you can get to Barrow is by airplane. I start researching Alaska road trips. A website pops up with a map leading to the arctic ocean. Where is that? I scroll in and I find my destination. 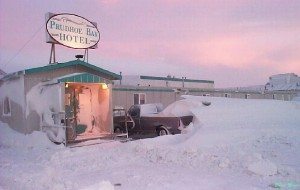 Prudhoe Bay, the unofficial northern most point of the Pan American highway. That’s where I will go. As far as I can tell, there is nothing in Prudhoe Bay. Well there is the booming population of 25. Yes, 25 people. Literally everybody knows you’re name, you’re probably even related. But that’s only the permanent residents. It’s an oil town. Sometimes there is even a whopping 2000-3000 people there working at a time. Remember how I said I can work almost anywhere? Well, I’m pretty sure anywhere does not include Prudhoe Bay, so rest assured I’m not going to be there long. I want to say something cliche like “It’s the middle of nowhere” but I’m thinking it’s really either(hard e) the beginning of nowhere or the end. I’m not sure where the middle is.